The Red Desert Nature Reserve also comprises several habitats ranging from coastal marine, grasslands, coastal forests, swamp forests, krantzes, desert and riverine to wetland. Matt Williams, a fourth-generation member of the family that has owned the land where the Red Desert is situated for more than 100 years, said myth and legend surrounded the origin of the desert, including stories that aliens had landed on the site. One of South Africa’s best-kept conservation secrets, the smallest desert in the world, lies 170km south of Durban. The Red Desert gets its name from the scarlet colour of the sand and is situated on a hillside overlooking the Mtamvuna River, which divides KwaZulu-Natal and Eastern Cape near the Wild Coast Sun casino complex. Only 200-metres in diameter and resembling a miniature version of the Arizona Desert in the United States of America, the man-high hills and valleys of naked red soil bare stark contrast to the surrounding lush and tropical vegetation. Archaeological artefacts going back millions of years can be found and the locals are pleased this is now an internationally-protected heritage site. “Truth be told, the origins of this desert are found in the location of a Zulu tribe in the 1800s, with vast cattle herds stolen from the Pondos. The terrain became severely over-grazed and subsequently eroded by wind, resulting in the desertification of the area with wind-sculpted dune formations. “The underlying soil has very high iron content, which does not allow vegetation to thrive,” he said, adding that tools from the Stone Age once used to chop up plants and seafood have been discovered. The Red Desert’s description was contained in navigation manuals as a sighting landmark for ships on their way up the Natal coast. In 2005, the Williams family, which is committed to nature conservation, formed a partnership with the Ray Nkonyeni Municipality, which consented to 105 hectares of municipal land being joined with the family’s 75 hectares for the purpose of creating a nature reserve. Negotiations then began with Ezemvelo KZN Wildlife and in 2015 the Red Desert Nature Reserve was established as a biodiversity stewardship nature reserve. This would ensure the effective management of land use outside existing state-managed protected areas, including privately-owned land, to ensure that natural systems, biodiversity and the ecosystem are maintained and enhanced for present and future generations. The area contains a significant area of “Critically Endangered” Pondoland-Natal Sandstone Coastal Sourveld found nowhere else in the country. The Red Desert Nature Reserve also comprises several habitats ranging from coastal marine, grasslands, coastal forests, swamp forests, krantzes (sheer cliffs), desert and riverine to wetland. At least 480 species of plants and 200 bird species have been recorded to date, with many listed as being under some degree of threat. Southern reed buck, common duiker, blue duiker and oribi have been seen. 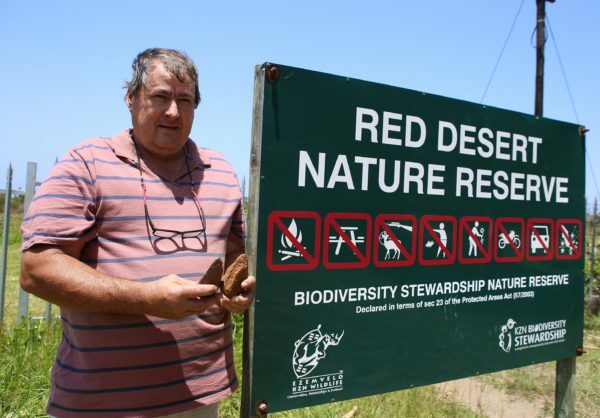 Williams, who is chairman of the Red Desert Nature Reserve Committee, said since the nature reserve adjoins the former R61 coastal route, which is now declared as the N2, many buck, deer and bush pigs have been run over by vehicles. He approached the South African National Roads Agency (SOC) Limited (SANRAL) with a request to fence the eastern boundary of the reserve and was most grateful that the request was granted. Ravi Ronny, SANRAL Eastern Region Design and Construction Manager, said discussions about erecting 2,7-kilometres of fencing had been ongoing since 2014. “Given the environmental importance of the nature reserve, we agreed to erect a fence along the reserve’s boundary with the road at our cost. “The fence will help keep animals away from the busy N2 whilst also combating trespassing and plant poaching problems,” said Ronny. He also said this section of the R61 is being upgraded at an estimated cost of R2,5-billion and will see the improved road becoming the “new N2”. The new fence has been erected at the revised road reserve boundary, which considers the future upgrading of the freeway. Presently, the N2 curves inland, away from the coast, near Port Shepstone and passes Harding and Kokstad before traversing the Eastern Cape. The upgrading of a 24km section of the newly-declared N2 from Mbizana River just south of Shelley Beach to the Mtamvuna River, will see this reconstructed road becoming the new N2. The new N2 on the KZN side will join with the N2 Wild Coast Highway currently under construction in the Eastern Cape. Once completed, the highway will be approximately 85km shorter than the current N2 alignment from Mthatha to Port Shepstone and will reduce travel time by about three hours. The existing facility will be upgraded to a divided four-lane facility (two lanes per direction separated by a concrete median barrier). The upgrade will result in the majority of existing accesses being closed and the intersections being replaced by interchanges. *** People who wish to visit the Red Desert Nature Reserve and enjoy the scenery, bird watching, archaeology, hiking, mountain biking or trail running may telephone Matt Williams on 0836319331 to book private tours. They may also visit themselves. There is no entrance fee.